Samsung’s next phone-tablet hybrid device has officially landed. 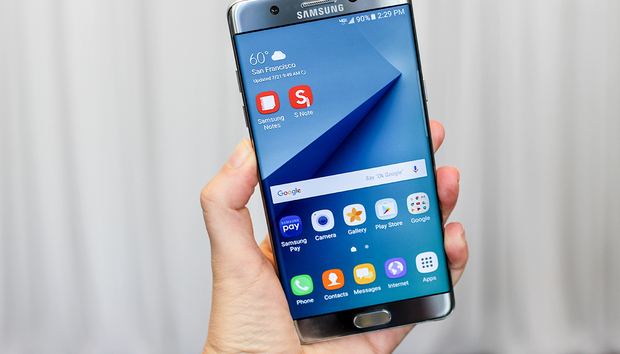 The company introduced the sixth-generation Galaxy Note 7 phablet in New York City on Tuesday. It features the latest hardware, a pressure sensitive stylus, and a spruced up interface, all packaged into a shiny metal-and-glass, water-resistant shell. And for the virtual reality-obsessed, Samsung has announced a new GearVR headset designed just for the Galaxy Note 7. You might be wondering why there’s no Galaxy Note 6 this year. That’s because Samsung opted to skip that number and jump straight to the number 7 so that its phablet line and flagship family—the Galaxy S7 and Galaxy S7 Edge—are directly aligned. Frankly, it makes sense to have both device types on the same page, so to speak. The name change also helps illustrate that the Galaxy Note 7 features many of the same components as the Galaxy S7. This includes a capable quad-core Qualcomm Snapdragon 820, 4GB of RAM, and an impressive 12-megapixel rear-facing camera with dual-pixel technology. And even though it has a larger 5.7-inch screen, it’s just as vibrant as the smaller Super AMOLED displays featured on the Galaxy S7 and S7 Edge. It’s the same resolution too (2560x1440, or Quad HD), though the larger size will make binge-watching on your commute more comfortable. The Galaxy Note 7 isn’t just a blown-up clone of its smaller brother. It has a 3,500 mAh battery (increased from 3,000 mAh in the Galaxy Note 5, but curiously a tad smaller than the 3600 mAh battery in the GS7 Edge) with both fast charging and wireless charging capabilities. It’s also water resistant, so you can dunk it in the pool with nary a worry, and it’s Samsung’s first phone to drop microUSB in favor of the newer USB-C standard. It’s worth noting that this is the only Galaxy Note variant you’re getting this year. Previous rumors pointed to both a flat version of the phablet device and an “edge” version making its debut, but there’s only one Galaxy Note 7. On the plus side, it’s a smartphone with curved edges that’s more comfortable to hold—not to mention more stylish—than other phones this size. Looking for a pressure-sensitive stylus in a smaller package? Take a look at the Galaxy Note 7. To help you take advantage of that slightly extra screen space, the Note 7 comes with a pressure sensitive S-Pen that docks in the bottom side of the chassis. It’s twice as pressure sensitive as last year’s, and like its predecessor, you can accidentally shove it in backwards if you’re really interested in causing yourself a headache. The S-Pen software has also been slightly tweaked with a few new feature offerings. And like the rumors suggested, the Note 7 does let you unlock it with your eyes thanks to a new retina scanner, which is faster than the thumb-to-fingerprint scanner method. You can read the whole scoop on what’s new by checking out our hands-on impressions with the Galaxy Note 7. The new GearVR headset is darker and slightly bigger than its predecessor. Samsung’s GearVR has undergone a makeover. The virtual reality headset now features a handsome dark blue and black color schematic. Samsung said it changed the colors because the white interior of the original GearVR caused a distracting reflection. The headset’s periphery view has also been slightly adjusted from 96 degrees to 101 degrees, and there’s a dedicated button that takes you straight to the GearVR store and library for easy viewing. You don’t have to worry about your older Samsung phone not working with the new GearVR, either. The headset now supports USB Type-C, but it comes with a MicroUSB adapter for those wielding older handsets like the Galaxy S7, Galaxy S6, and Note 5. The new Galaxy Note 7 and Gear VR will officially go on sale August 19. There’s no price point available for the Note 7 or Gear VR just yet, but we’ll update this as soon as it’s confirmed. At launch, the Galaxy S7 was only available through carriers in the U.S., with the unlocked model (free of carrier bloatware) landing only about a month ago. There’s no word yet if the Note 7 will initially sell only through carriers or if you’ll be able to buy an unlocked, carrier-free model here in the U.S.